A Devotee who faithfully engages in the worship of the Deity in the temple but does not behave properly towards other devotees or people in general is called a praakrutha bhakta, a materialistic devotee and is considered to be in the lowest position. 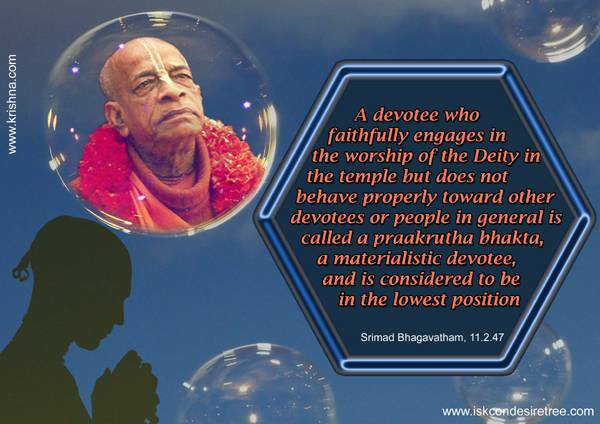 The second-class devotee, even though he cannot support his position with sastric reference, can gradually become a first-class devotee by studying the sastras and associating with a first-class devotee. However, if the second-class devotee does not advance himself by associating with a first-class devotee, he makes no progress. A devotee is considered superlative and superior according to his attachment and love. A devotee is very forgiving and tolerant of others but is very strict and determined with himself guarding against Maya. A person who is not bewildered by the inevitable miseries of material existence, and who remains aloof from them by remembering the lotus feet of the Supreme Personality of Godhead, is to be considered a bhagavata-pradhaana, the foremost devotee of the Lord. One becomes a devotee not by knowledge, but only by the mercy of a devotee.